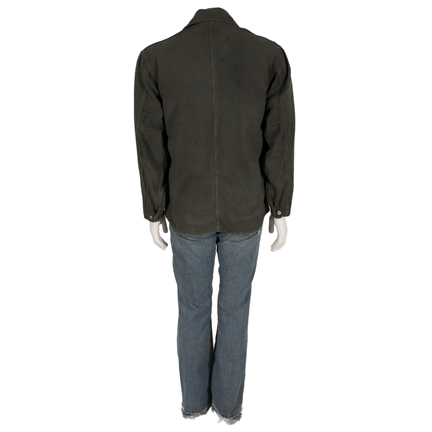 This signature costume change was worn by the character Jack Bauer played by actor Kiefer Sutherland in the sixth season of the award winning television series “24”, which ran from 2001 to 2010. 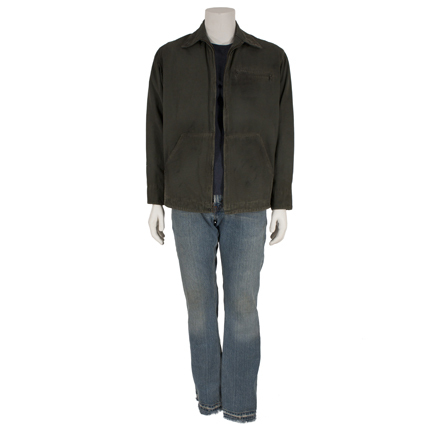 The outfit consists of an olive cotton jacket by Carhartt, a dark blue long sleeve t-shirt by Gap, and a pair of blue Levi’s denim jeans. 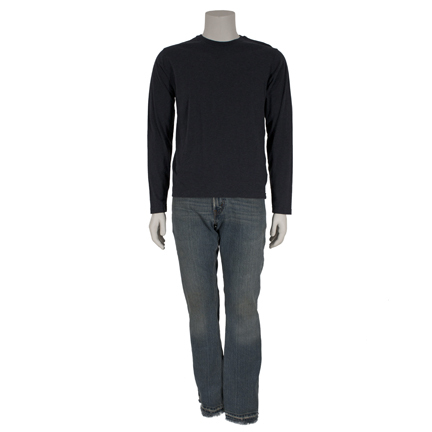 Mr. Sutherland first appeared wearing the jeans in Episode 2 (“Day 6: 7:00am – 8:00am”) when changing out of a set of “bloody” clothing after escaping from Abu Fayed (Adoni Maropis) and then continued to wear them throughout the majority of Season 6. 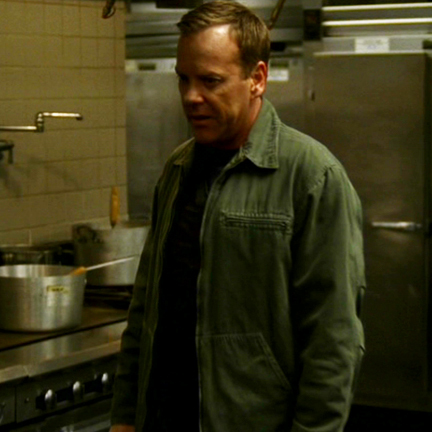 Later in the season he wears a suit for several episodes and then changes back into the jeans and blue shirt combination along with a bulletproof vest in Episode 14 (“Day 6: 7:00pm – 8:00pm”) during the tense sequence where Bauer manages to derail Fayed’s plan to detonate a nuclear armed aerial drone in San Francisco. 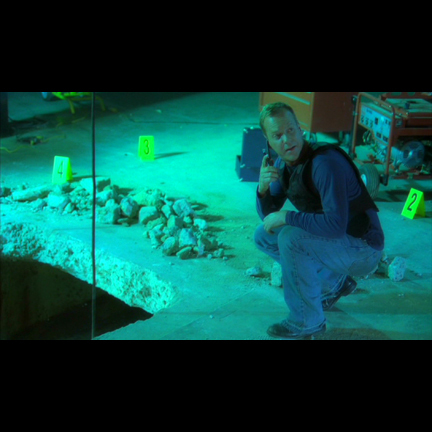 The complete ensemble with jacket (and bulletproof vest) were worn throughout Episode 15 (Day 6: 8:00pm – 9:00pm) all the way through Episode 20 (“Day 6: 1:00am – 2:00am”), at which point Bauer’s brought back to the Counter Terrorist Unit (CTU) offices in handcuffs wearing just the shirt and jeans after being arrested. 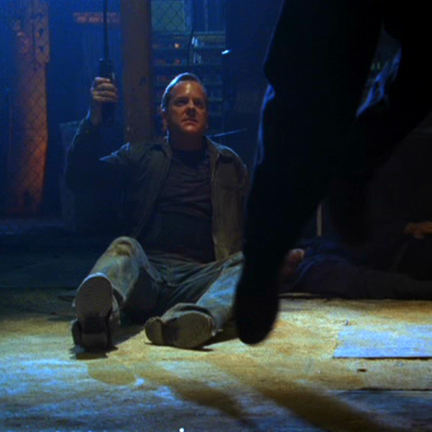 When the CTU is later attacked in Episode 22 (“Day 6: 2:00am – 3:00am”) Jack breaks free from custody and attempts to foil the Chinese attackers and rescue his nephew. 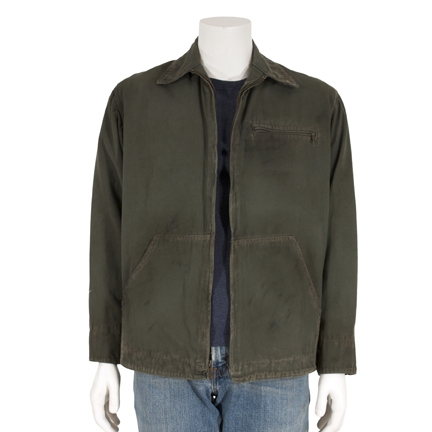 He continued to wear the jean and shirt combination (with and without a bulletproof vest) all the way up until the final episode’s closing scene where Jack stares out at the ocean in front of the house of Secretary Heller (William Devane) after the exhausting events of the day. 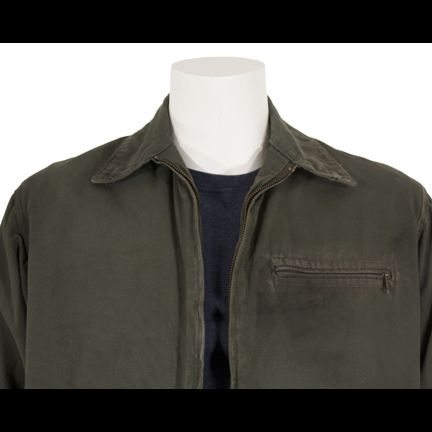 This signature wardrobe from Season 6 of “24” is in very good screen used condition and is accompanied by a letter of authenticity.